With the arrival of summer comes the unwanted emergence of three dangerous biting insects –– ticks, mosquitoes and fleas. Able to rapidly multiply and infect yards, homes and pets, many biting insects carry dangerous diseases easily transferred through contact. In order to protect yourself and your loved ones, learn to identify different bite marks and how they an affect you. 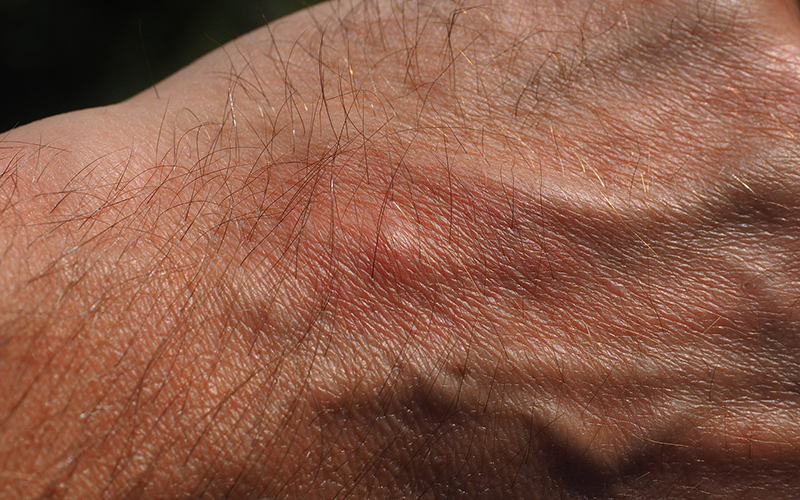 Tick bites appear red with a 1- to 2-inch red circle surrounding bite and cause itchiness and tenderness. Ticks are mostly commonly known for carrying Lyme disease, the most commonly reported tick-borne disease in Michigan. In 2017, more than 300 human cases of Lyme disease were reported with two-thirds of the cases reported in Michigan. Indicators of Lyme disease include a rash in a bull’s-eye pattern, flu-like symptoms, weakness in the limbs, joint and muscle pain, fatigue and fever. Mosquito bites cause a red, hard and itchy bump. Mosquitoes have increasingly been found carrying the West Nile virus in the US. Signs of the West Nile virus include fever, headache, body aches, skin rash, and swollen lymph nodes. Severe symptoms include a stiff neck, sleepiness, disorientation, tremors, convulsions and paralysis. However, about 75% of people have no symptoms so it is important to always be aware. Flea bites appear as red spots surrounded by reddened haloes and are extremely itchy. Fleas often target the legs and feet of humans and infest the bodies of domestic house pets. Fleas carry two diseases known as Typhus and Cat scratch disease. Typhus appears as a purple rash with symptoms of headaches, fever and belly pain. The amount of cases of flea-borne typhus keep rising each year. Cat scratch disease lives within a flea infested cat and spreads to humans through direct contact. The disease spreads through contact with saliva, broken skin, or the eyes, nose and mouth. Cat scratch disease appears as a red bump on the skin accompanied by fatigue and discomfort. Lymph nodes near the bite may also swell. If you experience any of these symptoms and are unsure if your home is infested with ticks, mosquitoes or fleas, consider contacting a professional exterminator. For more information on protecting yourself from biting insects from the experts at Smitter Pest Control, please contact us here or call us directly at 616.245.7215.